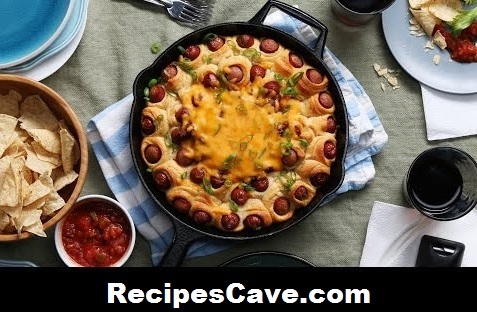 Chili Dog Bread Ring - Here is bread recipe for you, if you love hot dog then this recipe will help you make a better hot dog recipe easily. Cut hot dogs into thirds. Cut crescent roll triangles in half lengthwise so you have roughly 1-inch by 5-inch triangle slices. Arrange pigs in blankets around a 10-inch skillet in two tight circles, leaving a hole in the center of the skillet. Bake 15-20 minutes, until dough puffs up and becomes golden. In another large skillet, sauté onions until translucent. Add the ground beef to the onions, then season with salt and pepper. Continue stirring ground beef until mostly cooked. Add the tomato sauce, ketchup, cumin, chili powder, and sugar to the ground beef and onions. Stir until everything is well mixed. Simmer 10 minutes. When chili and the pigs-in-blankets skillet are both ready, spoon chili to fill the hole in center of the skillet. Top with shredded cheddar cheese and bake another 5-10 minutes until cheese is well melted. your Chili Dog Bread Ring is ready to taste.